… definitely is Applied Acoustics’ Lounge Lizard. If you’re a keyboard player I’d be surprised if the name and manufacturer is unknown, and Lounge Lizard not already in your portfolio of soft instruments. Whether you’re a professional or an amateur, virtuoso or average, this is a must have for anyone who love Fender Rhodes and electric pianos. A truly inspiring package for almost anyone. There’s a lot that makes this soft instrument stand out, collection of pianos, dynamics, and expressiveness and, as important, how easy it is to tune or change any of the sounds. I doubt you’ll find anything better and more exciting to play on in the market, especially considering a price of < $200. If this isn’t convincing enough maybe the below video will do the trick? 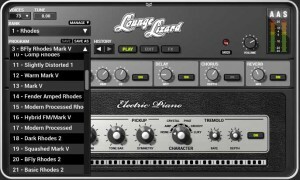 I’ve used Native Instruments Elektrik Piano for many years (discontinued), as I came across Lounge Lizard it took seconds to realize it’s in a different league. This entry was posted in Art & Music related, Data & computer related and tagged Music. Bookmark the permalink.